In 1982, the Viking Ship Museum began its first Viking ship reconstruction, the 14 m long coastal transport and trading vessel, Skuldelev 3. Over the next two years, Roar Ege was built at the Museum boatyard and the Roar Ege Project marked the start of a process that would form the core of the Museum’s research endeavours: the experimental archaeological reconstruction of ship and boat finds. Roar Ege was launched in 1984 and after more than 30 years on the water, has many sea miles under its keel. The years have, however, taken their toll on the ship. Roar Ege has undergone several major phases of repair – most recently in 2014. It was hoped this repair would keep Roar Ege in action for several more years but by spring 2016, the ship had deteriorated to such an extent that it was clear that Roar Ege’s sailing days were over. With Roar Ege’s retirement on land, its contribution to maritime experimental archaeological research now enters a new and vital phase. For the first time, we have a complete data set over the lifespan of a reconstructed Viking ship, from the first axe cuts into oak logs in 1982 to the last moments on the water in 2016. The paper will present an object biography of Roar Ege, from the perspective of both the boatbuilder and archaeologist, detailing the manner in which the hull has deteriorated and the components that are involved in its decline. This biography will be compared to the evidence for repair on the original ship-find, exploring the potential this data has for developing an understanding of the prospective lifespan of Viking Age ships, and the materials and resources entailed in maintaining and repairing them throughout their active use. The amount of reconstructions of huts from the Mesolithic period all over Northern Europe has boomed over the last 5 years, signaling a significant increase in scholarly interest. However, the scientific basis of these experimental reconstructions is often unclear. At the same time, the excavation and preliminary publication of two recently discovered Mesolithic huts in the Netherlands indicate structures of a completely different build than the proposed reconstructions. This prompted a study into the history of reconstructions in the Netherlands, as well as their archaeological basis and ethnographic inspiration. Remarkably, our perception of Mesolithic dwellings as (re-)built over the last thirty years turns out to have, for a large extent, been rooted in fantasy and misinterpreted excavations. In this paper I will trace the origins of the old, archetypal view of Mesolithic huts in the Netherlands and show how this view has persisted over the last 30 years. This is important because the reconstructions have had a significant impact on our perception of the Mesolithic, both in academic and public spheres. Finally, I will discuss the most recent developments and ideas about the character and appearance of Mesolithic huts, as gained from recent excavation data and reinterpretations of old excavations. This contribution focuses on the application of experimental archaeology to understand production, use and discard of specific textile tools from archaeological contexts including the prehistoric settlements of the current Rome area, Etruscan funerary contexts and the roman site of Pompeii where spindle-whorls were used in different ways and social contexts. It is commonly assumed that small sized spindle-whorls were used to favour spinning of specific kind of fibres in contrast to those who support the disadvantage in using these kind of artefacts to obtain threads; moreover, the recurrence of these objects as grave goods lead researchers to questioning about their role in daily activities and debating on their actual use as tools for spinning or clothes clips or beads. Experimental archaeology had a key role in this research for understanding and interpreting technological and use traces found on archaeological items. The multidisciplinary collaboration including archaeologists, use wear specialists, chemists and experimenters provided a scientific background for understanding actual use of textile tools according to the traces identified on experimental replicas systematically used as beads or tools for spinning. Experimental results will be discussed for shedding light on actual use and life cycle of such a specific kind of objects. Experiments with unfamiliar materials and processes are some of the hardest to design as plants and animals have individual, seasonal, and lifetime variations and small changes in the processing sequence can give very different end results. Perishable material culture is also challenging to present as it survives rarely and even then, the materials can be discoloured and fragmentary, with the remains lacking the qualities they held in life. Experimentation offers a rich resource precisely because of these problems as the results of experiments in processing materials, replicating and presenting archaeological finds will demonstrate. Replication of a unique set of early Bronze Age material from Whitehorse Hill, Devon, UK, will show the need for both broad experimentation to underpin decision-making and also the way in which archaeological analyses, craft traditions, and modern techniques such as 3D scanning, can work together. The Whitehorse Hill finds came from a cremation burial with rich goods such as beads made from amber, shale, pottery and tin. The perishable remains included a cattle hair and tin studded braided armband or bracelet, a nettle and hidework textile fragment and a limebast and cattlehair basket. Understanding these objects and replicating them involved knowledge and skills drawing on broad experimentation and detailed work specific to the particular archaeological finds. Examples include many different ways to process nettles (Urtica dioica) and hides and tackling ways of working with hair as a raw material. The crafted replicas and the touchable 3D prints were part of a three month museum exhibition, which was itself an experiment in presentation. Replication of archaeological and ethnographic Māori textiles, in conjunction with customary knowledge and practical experience, can provide a more nuanced understanding of objects made from fibre materials. The rareness of textiles belie their importance in pre-contact societies, and their often fragmentary condition provide serious constraints. Two case studies are presented here from the unique perspective of an archaeologist who is a customary Māori weaving practioner, familiar with a range of harvesting and processing methods for fibre materials, and the diversity of weaving techniques used. The first illustrates the broader archaeological application of textile studies by including the manufacture of stone tools and natural dyes required to process the fibre for a replication of a rare Māori finger-twining pattern. The second demonstrates the value of attribute analysis and the weaving of ‘tauira’, examples of techniques found on multiple fragmented archaeological textiles. This type of study provides empirical data to the archaeology discipline, while supporting, and contributing to, the continuity of customary knowledge systems. Experimental archaeology can be defined as the reconstruction of past buildings, technologies, things, and contexts and their testing, recording, and also use, experience and sensation, so as to enable a better understanding of past peoples’ lives and material culture. This paper will reflect on how we might think about physical sensation, perception, the experiential, the cognitive, and people’s embodied experiences in daily life. People in the Middle Ages obviously had the same physiological and neurological capacities as us to hear noises, to see things, to taste food and drink, to touch objects, and to smell their environment, but contemporary documentary sources reveal that they held very different beliefs and ideas about what was happening in any sensory experience. In early medieval Ireland for example, ‘darkness’ was thought of as a metaphor for deep and difficult-to-acquire knowledge. Using visual appearances (sight), odours (smell), texture (touch), sound (hearing) we will explore how these can "good to think with" in thinking about early medieval building reconstructions and early medieval iron-smelting practices. We will suggest that by using a ‘bricolage’ approach, using archaeology, experimental archaeology, early medieval historical sources, and our own senses, we can provoke new questions and more nuanced interpretations of the archaeological past. The main aim of this research is the study of the procedures that led to the creation of two bone figurines found in Parabita Cave (Lecce, Puglia) at the site of "Cave of Venuses", known as "Venere Grande" and "Venere Piccola". Following an experimental protocol, the reproduction of a series of trials was carried out on the bases of hypotheses reached through a microscopic analysis of the archaeological samples in the M.A.R.T.A. Museum in Taranto. The aim of these trials was to recreate some technological traces on bone objects with lithics that were similar to those found in Parabita Cave, whit a particular attention to gesture and posture related to the production of these traces. The comparison of the experimental traces with the archaeological traces allowed to obtain a "gestural matrix”. Furthermore, in order to achieve a three-dimensional view of the two archaeological figurines a 3D photogrammetry technique was applied. The 3D view allows the proper interpretation of technological traces in areas where the surface of the archaeological figurines is very curved. The result has been a schematic description of the actions involved in the making of the two bone Figurines. Pointed bone tools exhibiting horizontal grooves across the lower shaft, are frequently found in Ancestral Puebloan sites in the American South West. The function of the tool and the cause of the grooves has been a topic of debate. This presentation details the research into possible causes of this grooving, based on materials and products produced during the time period in which these tools appear. The use of split breast feathers for making twined robes and a heavy reliance on Yucca sp. for producing a wide variety of utilitarian items is explored experimentally as possible materials leading to groove formation. An evaluation of the efficacy of these tools in combination with microscopic use-wear analysis is used to propose a likely cause for groove formation. Further support for the proposed theory is offered by highlighting a technology shift which accounts for the absence of these tools in earlier contexts, and their abundance in later sites. To date, archaeologists still often use a typological approach to assess the functions of bone artefacts from the Roman Period. In some of these assigned typological groups certain artefacts do not have a clear definition. Researchers hold differing opinions on the differences between the typological groups of stili and spindles. The aims of the study were to assess whether use-wear analysis could be applied to bone artefacts from the Roman Period and if it would help to identify the function of these artefacts. Artefacts from Augusta Raurica, Switzerland were examined by means of use-wear approach and compared to replicas. These replicas were experimentally crafted with lathe, files, knives, and other tools, as the traces of those tools had already been observed on the artefacts. The replicas were then used to write on wax tablets. Examination and comparison of the production and use-wear traces on the artefacts and replicas led to the preliminary results here. Two artefacts were identified as stili, showing the same traces as the replica stili. The remaining artefacts, which were typologically determined as spindles, showed different traces. This preliminary study produced some interesting results but also left many open questions in need of further examination. Heavy-duty bevel-ended tools, such as adzes made from metapodial aurochs (Bos primigenius) bones are commonly found in early Holocene archaeological sites of hunter-gatherers in Europe. The artefacts of this kind represent an interesting indicator of the complex and rich manufacturing output of this time in Europe. The objectives of the presented study were to test possible prehistoric manufacture techniques and tools used for production of this kind of artefacts according to observations of archaeological finds. Also, experimental works associated with usage of prepared replicas were performed. During the experiments, a wide variety of household activities were tested, taking into the account many possible variables, such as: the kind of worked material (soil, wood, hide, ice), the type of activity performed (digging, debarking, hewing, scraping, chiselling) and the duration of work. The effectiveness and suitability of the tools for those varying activities were also examined. The study was complemented with use-wear analysis, which allowed to document and study, all of the technological and use-wear traces. Results of the traceological analyses were correlated with the selected archaeological materials from the Polish Lowland. The role of Australian animals in past Aboriginal diets is not well understood. We know very little about animal ‘bush tucker’ and its nutritional value, or how it was hunted, butchered and cooked. Ethnographic studies have shown that prey animal butchery and body part division played an important role in past Aboriginal social and economic cohesion. Using a multidisciplinary approach of scientific experimental economic utility and nutritional analyses coupled with ethnographic accounts, as well as Indigenous knowledge of past and modern hunting, butchery and cooking practises, this project aims to establish significant baseline data that can assist in interpreting Australian zooarchaeological assemblages. This paper will discuss some of the results of this study involving species’ known to have featured predominately in the diets of Aboriginal Australians. When complete this information will be added to the open access La Trobe University ‘Australian Archaeology Mammal Bone Image Database’ (http://insight.lib.latrobe.edu.au:8180/luna/servlet/LTUCM~2~2), making it the most comprehensive of its type anywhere in the world. It will be a significant resource for those studying Australian fauna, as well as those investigating the potential role of native fauna in the modern Australian diet. One of the major challenges in experimental archaeology is designing experiments that sufficiently represent the time periods and cultures under investigation and that are scientifically replicable within acceptable tolerance limits. This includes using tools, raw materials, and techniques that would have been available at the time. Often times, the experiments we conduct include traditional skills and techniques that are no longer commonplace in modern societies. It is therefore our responsibility to seek out individuals with experience and a more intimate knowledge of these practices. An additional challenge is using modern day materials, depending on the nature of the materials under investigation; these may not be representative of the resources available in the past. This research examines the intersection of ethnoarchaeology and designing archaeological experiments using modern raw materials, specifically looking at pyrotechnology of the North Atlantic during the early medieval period in order to better understand fuel residues in the archaeological record. The study here presented is part of a larger research project on Roman viticulture started in 2013 on the slopes of Etna in Sicily. This project, inspired by reading of the Roman agronomist Columella, aims to improve the knowledge of wine production cycle in the Roman world (1st century BC - 2nd century AD) since, as yet, there is no study that analyses the entire production process. This contribution investigates, to reconstruct, the enology of the Romans (the set of operations that transformed grapes into wine). In fact, the structures necessary for these processes were an important part of Roman farms and villas. Starting from the analysis of the remains excavated in numerous sites in Italy it is possible to reconstruct various stages of processing. Furthermore, analysis carried out on ceramic materials coming from some production sites allow reproduction of the coating of the wine vessels' coating techniques and to evaluate their efficacy and impact. The archaeological data can be integrated, finally, with the indications of the texts of the Roman agronomists. Starting from these data, a wine-making experimental protocol was prepared that gave start to, in September 2017, a first-generation experiment completed in April 2018 that could be the basis for subsequent research. Archaeological excavation evidence alone confirms that a wide variety of foodstuffs was available to consumers in the Middle Ages. These products included raised, hunted, and home-grown foodstuffs, particularly animals, poultry, vegetables, herbs, fruits and cereals. Fish too were an important addition to the diet, as were spices. In Ireland, as with the rest of Europe, cereal products constituted perhaps the most vital staple food of all, bread being the most common product consumed throughout all European countries. Having no known remaining recipes written down in the Irish record, excavation evidence of zooarchaeological and archaeobotanical remains are vitally important when considering what may have been eaten at meals. This data is particularly useful when combined with references to foodstuffs in primary historical documents. Collectively this information gives an insight into the culinary potential of likely dishes, informed by probable influences known to have existed. From the simplest form of nourishment, to a splendid feast, food has always had the opportunity to provide comfort and pleasure, in medieval times as much as nowadays. Combining experimental and culinary archaeology, it has been possible to provide a sensory experience largely unexplored heretofore, bringing a new dimension to the archaeological research of food. Residue analyses on a Gravettian grinding tool recovered at Grotta Paglicci sub-layer 23A (32.614±429 cal. BP), Southern Italy, have demonstrated that early modern humans collected and processed various plants. The recording of starch grains attributable to Avena (oat) caryopses expands our information about the food plants used for producing flour in Europe, during the Palaeolithic, and about the origins of a food tradition persisting up to the present in the Mediterranean basin. The particular state of preservation of the starch grains suggests the use of a thermal treatment before grinding, possibly to accelerate drying of the plants, making the following process easier and faster. The goal of the present communication is to reconstruct the technologies for complex processing of the whole oat caryopses to obtain flour, including de-husking and thermal pre-treatment before grinding. Paper 16: Tepe Gawra, Evidence of an Advanced Technology out of Time? We present the results of an experimental path carried on at the Perfumery Theme Park Museum of Cyprus focused on Mesopotamia ancient distillation, using pots found in different levels of Tepe Gawra, dated between 4300 and 3500 BC. The site of Tepe Gawra fascinated students for decades, for the extraordinary repertoire, including funnels and strainers, jars with spouts positioned in a different manner, with two and three mouths and neck, with a channel pierced rim, or with a hole strategically positioned near the base, suggesting a specific employ to distil. After making the replicas without the wheel, we used the pots to arrange the apparatuses testing their functionality with plants of the Troodos forest, the same present in the North-East Mesopotamia biodiversity. All the devices assembled worked perfectly for hours, confirming the thesis of Martin Levey, who in 1950 recognised in them the origin of Arab distillation. However, even if experimental archaeology has demonstrated that you can distil with these pots, the discussion remains open on which product, perfumes or alcoholic beverages they were intended for. Scaphopod shell beads were recovered from the late Pleistocene units in Boodie Cave on Barrow Island during the 2013-2015 Barrow Island Archaeological Project excavations. Twelve of these beads were recovered in close association, possibly from a discarded string of beads from a necklace. One of the beads has been directly dated to 10.8 cal BP with the other beads dating to between 22.5 and 6.7 cal BP. The beads exhibit small amounts of edge damage and wear indicting that they were strung and worn. When compared to beads from excavated contexts in the Kimberley (1000 km away), however, the Barrow Island beads show limited wear. In Australia, there is little research into scaphopod beads manufacture and use and the question as to how much the Barrow Island beads had been used can only be addressed through experimental archaeology. This paper will describe the wear on the Barrow Island scaphopod beads, historically collected beads from the Pilbara and compares that wear to experimentally made and worn scaphopod beads. The experimental bead sets were made using both archaeologically and Aboriginal ethnographically observed bead manufacture techniques. They were then strung on two different fibres in two different configurations. These were then agitated at set intervals and imaged under a microscope to determine how much polishing and edge damage is caused by stringing and wearing scaphopod shell beads. Using all three data sets I will then discuss the implications for the making, use and wearing of scaphopod shell beads by Aboriginal people from Pleistocene to the present. The Early Mesolithic site of Star Carr is located on the southern shore of Palaeolake Flixton, North Yorkshire (UK), and is regarded as the most famous Mesolithic site in the UK. During Grahame Clark’s 1949-1951 excavations, some 23 shale beads were discovered. With new excavations between 2003-2015, this number has increased to 33. Historically, the beads and pendants were poorly understood, with little known about how they were made and used, or what role they played in Mesolithic lifeways. We present the results of actualistic experimental archaeology, paired with extensive scientific analysis of the archaeological specimens, including: SEM-EDS, microscopy, microwear analysis, residue analysis, raman spectroscopy, photogrammetry, and 3D modelling of the newly discovered beads and pendants from Star Carr. Using these techniques, we present an interpretation of the life history of the beads, with particular focus on: 1) the sourcing of raw materials, 2) the method of shaping, 3) the method of perforating, 4) the method of engraving, 5) the presence/absence of colourants, 6) how the beads and pendants were worn, and 7) the significance of their deposition. Using these insights, we explore the possible role of the beads and pendants in Mesolithic lifeways at Star Carr. Most people recognize that experimental archaeology and open-air museums are an effective tool to learn about the past. This paper will delve into social theory to explain why experience is such an effective means to get a better understanding of past society. Drawing primarily on Anthony Giddens and related theorists, this paper will discuss the foundation of experience in the creation of culture, and how recreating practice is a step toward recreating culture, allowing better interpretations of the past by modern scholars. Examples and discussion will be drawn from research on recreating ceramics and food from the past, including medieval Europe. Stone tools can, apart from human-made retouch, exhibit traces of damage due to post depositional processes. As a result of post depositional factors, whether animal, human or natural in origin, this damage can sometimes be interpreted as human-made retouch, even though it is actually the so called pseudo-retouch. Due to the problems arising in differentiating these two wholly opposite things, the last few decades have shown an increase in trampling experiments, the goal of which was to separate and recognize real retouch from pseudo-retouch. This presentation is going to show three such experiments executed by the authors, their methodology and results, as well the comparison to the results of the pseudo-retouch analysis done on lithic finds from a Middle Palaeolithic site of Mujina pećina in Croatia. The third experiment also consisted of taking a sample for soil micromorphological analysis which provided even more insights into this complex topic. By using a Critical Social Science approach, experimental archaeology contemporary practice can be defined as a complex social phenomenon. While nominally addressing the enhancement of the interpretation of the archaeological record, experimental archaeology brings together different individuals or groups of people, all of whom enjoy their experience at different levels of meaning. This new approach on experimental archaeology focuses on exploring the multi-layered reality emerging from the constellation of meanings attributed to experimental archaeology as well as aiming to clarify the time perspective in the research purpose, the social dynamic and the social responsibility of contemporary practices. The results of a qualitative online survey will be illustrated as part of the ongoing PhD project “Exploring the uses of experimental archaeology in European AOAMs” (IRC GOIPG/2017, UCD, Dublin - IE), aimed to detect and explore best practices. Insights will be given regarding the conceptual map, its evaluation from a research perspective and from a social interaction perspective, by describing the relationships (HR included) among every evaluated category (research institutions, AOAMs and independent activities). By the Middle to Late Bronze Age, the layout and construction of many copper ore smelting sites throughout the eastern Alpine region tended to be very similar, pointing to a certain amount of standardisation in the smelting of copper sulfide ore.
As part of a PhD thesis, E. Hanning carried out a series of copper smelting experiments in furnaces reconstructed from these finds. The main goal was to reevaluate the archaeological record and test the theoretical reconstructions of the smelting process. A second series of experiments was carried out in the summer of 2018 as part of a DFG-funded research grant (S. Klein, Th. Rose). The focus of the grant was not the reconstruction of an archaeological find complex, but instead on the development of new archaeometallurgical analytical techniques, in particular the behavior of copper isotope fractionation during smelting under conditions similar to those in a prehistoric smelting furnace. The two different projects have shown how experimental archaeology can be successfully used for scientific research – on the one hand for the reconstruction of archaeological remains and metallurgical processes, and on the other for the development of new applied scientific analytical methods. The aim of this contribution is to illustrate our experience with the experimentation of embossed decorations. As a re-enactment group (Popolo di Brig, Italy) focused on Celts and Ligurians of the second Iron Age, we reproduce objects and/or decorations often made with the embossing technique: helmets, jewels, brooches, belt hooks and various appliques. In spite of the abundance of such artefacts, we are facing an evident lack of tools that can be clearly identified as the embossing ones. Even when a finding is preserved well enough to be classified as a tool, it is quite impossible to define its particular function. We have therefore reconstructed tools in various materials, practically experimenting them to verify which ones gave the most similar results to the preserved findings. This allowed us to propose a more appropriate craft activity both in events of historical re-enactment and during didactic internships at museums and schools. In 5-7th century CE England, many buried their dead with a spear. Archaeometallurgists who examined these artifacts observed that spearheads’ iron blades frequently contain annealed microstructures (e.g., spheroidized pearlite) from being softened in a fire, rendering them ineffective weapons. Experts disagree whether this softening was a byproduct of spearheads’ manufacture in a forge fire, or the result of reheating the spearhead later before its burial. The discovery of several small hearths in early medieval cemeteries, one of which contains a burned spearhead, suggests that spearheads may have been deliberately destroyed (“killed”) at the graveside during funeral rites. This paper tests whether the annealed microstructures found in surviving spearheads can be created through such a process. This study subjects contemporary spearheads to several heating scenarios to test which produce the microstructures observed in medieval artifacts. The spearheads are forged from partly carburized nineteenth-century wrought iron, an alloy with comparable metallurgy to medieval bloomery iron. Three heating scenarios test the null hypothesis that annealed microstructures naturally occur during manufacture. In two further scenarios, finished spearheads are reheated in hearths like those found in cemeteries. The spearheads are then analyzed using metallography to observe the resulting microstructures, which are compared to surviving artifacts. A kiln firing experiment was run at the Campus Galli Open-Air Museum. The experiment was carried out in collaboration with the Competence Center Archaeometry Baden-Wuerttemberg (University of Tübingen) using an updraft kiln built according to archaeological examples from the Early Medieval Period. Similar kiln constructions were used in different areas and periods, making the results even more interesting. The entire process from the preparation of the raw material to the firing and opening of the kiln was carefully recorded with a particular focus on the study of the raw materials used for pottery making but also fuel usage. The temperatures were monitored employing 12 thermocouples placed at different positions in the combustion and in the firing chamber. The aim of the experiment was to support archaeometric studies about ceramic pyrotechnology with information about microstructural developments in both kiln structure and sintered ceramics produced in this type of installation. The interdisciplinary approach was applied by a team of scientists from experimental archaeology, archaeometry, geoarchaeology and botany. Our paper reports on the first results and discusses how to improve research strategies for this type of experimental studies with archaeometry. The Mayen potteries (district of Mayen-Koblenz, Rhineland-Palatinate, Germany), most likely produced wares for a supra-regional European market from the late Antique to Medieval Ages. Due to well-documented archaeological finds and archaeometric studies, this area is particularly well-suited for a model study of the economic and technological development of a pottery district. Our study focuses on the experimental archaeological evaluation of kiln technology and material design. We reconstructed an updraft shaft kiln from finds from Mayen (ca. 500 AD). This was periodically fired over three years in order to test different parameters within the ceramic making process. Parallel to this, the maximum possible usage of the local clay, from a ceramic technological point of view, was tested and compared to the types of wares that were actually produced in the workshops. We could prove a conscious decision to concentrate on a limited amount of wares that had the best chance to be sold in the target market area. Data collected during the experimental kiln firings allow preliminary calculations of the productivity of the Mayen potteries, and also answers questions of energy efficiency, care and longevity of such production facilities. Finally, the next phase of the research project will also be presented. The high quantity of pottery sherds unearthed in the Bronze Age village of Via Ordiere (Solarolo, RA), suggested that we explore the technological and functional features beyond the original artifacts. Through macroscopic and archaeometric analysis it has been possible to define some of the ancient pottery main characteristics, such as raw materials and manufacturing techniques. Although this research underlines the chaîne opératoire steps, its main goal is inspecting the surface treatments chosen and applied to the pots, in order to understand the link between them and the objects function. According to the preliminary lab analysis and thanks to the experimental approaches, we have been able to better define the productive techniques used to realize the pottery artifacts under analysis and reconstruct experimentally the way chosen to shape vases, the treatments applied to surfaces, and the respective instruments used. After the firing of these experimental samples, we have observed through RTI methods the visible traces left on the vases' surfaces and we have compared these analyses with the archaeological remains’ ones, in order to create a preliminary comparative database. Finally, we made functional experiments like impermeability tests to suppose which technique could suite the proper function of each shape and treatment. This paper discusses the application of Experimental Archaeology in addressing and integrating archaeological queries and education. The experimental approach was tested in the exploration of the manufacturing technology of large corded plates of Central Anatolian Late Bronze Age period in order to detect specific technology and levels of labour intensity. The Hittite ceramic tradition is characterised by a high degree of standardisation, linked to the massified and centralised organisation of ceramic production developing with the rise and growth of the Empire. Among the wheel-made inventory, large plates are the sole hand-made morphologies, apparently contrasting with any principle of production maximisation. Are they the outcome of a specific household demand, tradition and/or manufacture? Or are they ritually significant? Previous investigations aimed at reconstructing the chaine opératoire suggested a relatively long process. May less time-consuming procedures be postulated? Only an exhaustive comprehension of the working economy allows a better understanding of the cultural significance of this ceramic type. Through a multidisciplinary approach, which involved reading of archaeological evidence, archaeometry and residual analysis, the students tested the full process of an ancient production and recorded data issued from the experimental activity, measuring their technical expertise and knowledge of raw materials and craft works. Within the program, Prehistoric Pottery: Interdisciplinarity and Experiment, a series of archaeological experiments were carried out with the purpose of a more comprehensive understanding of the prehistoric pottery production mechanisms during the Copper and Bronze Age in northern Croatia. The program has educational-research and popular character and was intended primarily for the students of archaeology with the aim of studying the pottery through the prism of technology, function and social aspects. One of the aims is the reconstruction of the individual steps undertaken by a potter in the manufacture of the product, by using different variables (different raw material, various types of temper material, different building and surface treatment techniques as well as used tools and various firing techniques), and in accordance with the scientific issues. The process of designing and conducting the experiment has shown that the research questions, as well as the dynamics of deliberate and controlled experiments, had become more and more complex. It was also shown that this effective approach is a good tool that leads us very close to the concept of choices made by the potter, which ultimately lead to the much more complex interpretations that move within technical, technological and social explications. Despite the widespread application of high-resolution quantitative methods in bone taphonomy, very few studies have focused on projectile impact marks (PIMs). Therefore, we explored the potential of 3D microscopy in distinguishing bone hunting injuries from other taphonomic marks, developing a widely-applicable diagnostic framework based on experimental data and focused on Late Epigravettian projectiles. Here we present the results of two ballistic experimentations, the first one carried out on medium-sized ungulates and the second focused on small games. The peculiarities detected in morphometrical analyses are strictly related to Late Epigravettian projectiles, providing a reliable diagnostic framework for archaeological interpretation. The validity of our observations has been tested on Late Glacial faunal assemblages coming from two rock shelters in North-eastern Italian Alps. 3D measurements, processed through statistic, led to the recognition of several PIMs: one drag with embedded stone on a brown bear rib from Cornafessa rock shelter (Lessini Mounts, Trentino) and some other drags on alpine marmot bones from Grotte Verdi di Pradis (Pradis plateau, Friuli Venezia-Giulia). In light of the efficiency of the diagnostic framework developed and the effectiveness of this new methodological approach, the recognition of hunting injuries is proposed to become a standard practice in zooarchaeological studies. Although both knapped and, to a lesser extent, polished lithic industries traditionally have been given great regard within the archaeological studies of northwestern Iberian Peninsula, mostly focusing on their typologies and the materials used. However, this has not happened with other stone objects, such as rolling stones, that tend to appear in certain prehistoric contexts - especially when they do not show signs of intentional knapping. Thus, we propose the study of a set of pieces of this type coming from an Iron Age context with the objective of categorizing its use, multifunctionality, and importance within the domestic sphere. For this, we will elaborate on the given project in three parts: firstly, carrying out a morpho-typological study based on the existing bibliography, secondly, trying to establish the corresponding ethnoarchaeological equivalents, and, finally, experimenting with the use of utensils of the type proposed in various domestic applications. The evolution of technological complexity is one of the major issues in current archaeological research. Its study requires the use of a standardized language allowing homogeneous comparisons between technocomplexes. We propose a new methodology in the study of manual gestures in lithic tool production during the Early and Middle Pleistocene, by using a lithic knapping gestural catalogue based in ethological and archaeological foundations. This allows a detailed approach to the necessary actions reflected in every knapping sequence. In order to evaluate the catalogue's effectiveness, we have developed two pilot experimental programs. In the first one, five expert knappers have elaborated one chopper, one chopping-tool and one handaxe each. The goal of the experiment was to decode the gestural chain involved in the production of these tools. Our results confirm the possibility of identifying particular manual gestures of each knapper at elaborating each tool and those shared by all of them. The second program was aimed to identify the manual gestures that can be recognized in the archaeological record. To do this, we have developed an analysis documenting the loss of information occurred since the beginning of the original knapping event to the moment that the archaeological object is recovered. In 2012, several wooden artefacts were found in the late Middle Pleistocene open-air site of Poggetti Vecchi (Tuscany, central Italy). These are wooden sticks made of a boxwood (Buxus sempervirens) clearly showing wear produced by human activities. Following ethnographic comparison, the tools may be interpreted as digging sticks, multipurpose gear commonly used among hunters-gatherers groups. Besides their simple morphology, the Poggetti Vecchi digging sticks show technical features that must be related to a manufacturing process which includes several working stages. An experimental program has been carried out in order to reconstruct the operational sequence performed for the production of these tools. The experiments show a complex of technical choices, different production activities, and a rigid manufacturing process that must be followed from the choice of the wood until the final shaping. Interestingly, the presence of a burnt film on the external surface of the Poggetti Vecchi wooden sticks demonstrates the use of fire during their production; the experiments have confirmed fire was a powerful tool for the production of the tools. This work shed new light on the capabilities of the early Neanderthals to adapt to the environment, widening our knowledge about their woodworking competencies. This work presents the results of an experimental programme focused on the manufacture of Late Palaeolithic backed points. In order to identify the retouch techniques used to produce an archaeological assemblage of backed points from the Late Epigravettian layers of Riparo Tagliente (Verona, North-Eastern Italy) different combinations of retouchers (i.e. lithic vs. organic) and force application modes (i.e. percussion vs. pressure) were tested. Thanks to a morpho-scopic analysis, it was possible to identify and describe numerous micro- and macroscopic criteria useful for the archaeological identification of retouch techniques. The reliability of these criteria was validated through three different kinds of blind-tests and after comparing archaeological to experimental materials it was possible to attest the use of two retouch techniques. For one of these it was the first identification in an archaeological context. Experimental archaeology has been instrumental in defining and clarifying pottery production practices from the earliest use of the pottery wheel, leading to powerful insights into the social and cultural forces influencing technological change. The Tracing the Potter’s Wheel project employs a multifaceted research programme to investigate knowledge transmission across potting communities practicing their craft during this time of technological innovation, specifically tackling the evidence from Bronze Age sites in and around the Aegean Sea of the eastern Mediterranean. As it is one of three methodological approaches used by the project’s team, the prominence of experimental archaeology within the project provides the opportunity to discuss the mechanics of comprehensively integrating experimental methodologies into broader archaeological projects. This contribution to EAC11 is twofold. Firstly, the results of replication experiments are discussed; the forming traces specific to wheel coiled and wheel thrown pottery are compared against archaeological material. Secondly, the embedded nature of experimental research within the wider project is discussed. The reflexive stance taken can provide guidance on better integration of experimental approaches into similar types of nationally- and internationally-funded multiyear projects, to the benefit of experimental archaeology as a field. The archaeological site of Gradište Iđoš (Serbia) in the south-central Great Hungarian plain was occupied over a period of 5000 years, from Europe’s first Neolithic to the Late Bronze/Early Iron Age period. Due to its scale and character it is declared as a site of great cultural importance in the national heritage legislation. An ongoing pottery technology project with experts from different fields including ceramic studies, experimental archaeology and archaeometry aims to understand pottery production at the site during the Late Neolithic/Chalcolithic period (5200-4800 BC). This phase is marked by two different material cultures, Vinča and Tisza, often present in the same contexts. In this presentation we show preliminary results of a pottery pit firing experiment carried out in Serbia, but also lab experiments both based on archaeometric studies of pottery from Iđoš. The ceramic samples produced in the pit firing and in the laboratory of the CCA-BW with local raw materials from the same type used in the prehistoric period are compared to the archaeological ceramic using ceramic petrography, XRD and SEM analyses. The main aim of this study is to have a better understanding of the firing techniques employed in the pottery production of the Late Neolithic/Chalcolithic period at this site. In the context of the BEFIM project ("Meanings and Functions of Mediterranean Imports in Early Central Europe") a selection of vessels from the Early Celtic hillfort settlements of Heuneburg and Vix-Mont Lassoix were microscopically studied for traces of production and use. In order to create a meaningful reference collection, we performed dozens of experiments to explore the way this pottery was made and used. An experienced potter reproduced exact replicas of the archaeological vessels and investigated in detail the traces of production and the effect of temper, baking temperature and so forth on the development of production traces and use wear. Especially variations in temper strongly affected the characteristics of the use wear traces from food and drink preparation and consumption. The effect of alcohol production, including fermentation, on the pottery surface was explored. We also tested the effect of different gestures of preparing and consuming food and drink, as well as storage and handling. Last, we studied the effect of post-depositional processes on the traces of production and use. The traces we observed on the experimental vessels, using an integrated low and high power approach, formed the basis for our interpretation of the archaeological pottery. Knapping techniques in the early technologies have been analysed thanks to experimental researches. Unfortunately, this approach usually lacks a strict comparison with archaeological data, mostly due to the difficulty to recognise indisputable percussion marks or to the paucity of hammerstones. In addition, scarce attention has been paid to the percussion gestures both in technical and motor skill perspectives. The Thomas I-unit L1 site in Casablanca (~1.0 Ma) yielded a rich early North African Acheulean assemblage. A considerable number of cobbles display battering marks, belonging to their use as active hammerstones for knapping. Our hypothesis is that the extension and location of these impact damages demonstrate 1) the adoption of an orthogonal vs. tangential gesture in the hand-held percussion and 2) stable motor habits allowing a repetitive striking precision. An experimental program, coupled with a technological study of the artefacts, was carried out to test this hypothesis combining technical, behavioural, morphological, and biomechanical approaches. The use of 3D morphometric analyses on both archaeological and experimental material allow a quantification of the life-time of the hammerstones. The results allow a careful investigation of the knapping percussion in the early North African Acheulean providing a methodological tool for interpreting early technology percussion behaviours. Göbekli Tepe, excavated since 1995 by the German Archaeological Institute, is famous for the earliest monumental architecture of mankind. However, it also deserves the superlative for another reason. More than 10,000 grinding stones, including flat slabs, deep bowls, mortars, pestles and handstones, tell a tale of large scale plant-based food production in a hunter-gatherer context. As charred plant remains are largely absent from the site, use-wear analysis is particularly important to determine the functions of the grinding stones. Since 2016, one of the main strategic aims of the open-air museum Düppel in Berlin is to become established as a living research lab for experimental archaeology. One of the first projects in this context is the cooperation with the German Archaeological Institute. An experimental project on production, use and analysis of resulting use-wear patterns on handstones and grinding bowls as well as the experimental production of Neolithic beer was started in 2017. Several sets of handstones and grinding stones were used for grinding flour, others for crushing of malted einkorn. Two kinds of surface deformations could be observed, which correlate with the deformations on the Neolithic finds. The present paper will present the main findings of the projects. This research investigates the use of the Middle Palaeolithic stone-tipped spear technology among Neanderthal populations. Although the presence of stone tool projectiles in European Middle Palaeolithic sites may suggest the adoption of composite hunting weapons possibly from MIS 6 onwards, the use of these weapons as close-range thrusting spears or long-range throwing spears is an outstanding argument in the Palaeolithic archaeology. Here there are presented systematic experiments that extensively tested the use of hand-delivered throwing and thrusting stone-tipped spears, using Levallois point replicas. Trained human participants threw and thrust experimental stone-tipped spears into animal carcass targets. For each throw and thrust, several variables were recorded. The influence that different experimental variables, such as tool morphology, delivery modes (throwing vs thrusting), and ballistic parameters, can have on the formation of macroscopic and microscopic traces during projectile impacts was investigated. Integrated results between macroscopic and microscopic use-wear analysis and ballistic investigation show that trace patterns provide useful markers for distinguishing hand-delivered spear systems. These findings provide methods for further testing of the hypothesis that the hand-delivered throwing stone-tipped spear technology was in use at least from MIS 5 in the European Middle Palaeolithic. In 1995, an unusually perforated femur of a juvenile cave bear was found in the Divje babe I Palaeolithic cave site in western Slovenia. According to its archaeological context and chronostratigraphic position, if made by humans, it could only be attributed to Neanderthals. The crucial question was related to the origin of the holes. These could only have been made either by a carnivore or by human intervention. Results of experimental testing of both hypotheses do not support a carnivore origin of the holes. Experimental piercing on fresh brown bear femurs using metal dentition casts of wolf, hyena, and bear showed, that four holes exactly aligned on the middle of the longitudinal axis of the diaphysis could not be reasonably explained by carnivore action. Experimental archaeology has proven that morphologically identical holes as in the Neanderthal musical instrument could be made by replicas of stone and bone tools, found in the Mousterian levels of Divje babe I, without leaving any conventional tool marks (i.e. cuts and micro-striations). Recent musical experiments performed on a replica of the reconstructed musical instrument revealed its great musical capability. The procedure of artificial piercing the juvenile bear femur will be practicaly presented. Cremation is a burial practice which has been adopted by numerous cultures throughout time and space. Experimental archaeology can play a major role in the understanding of the pyro-technology and the heat induced changes on bone structure. Exposure of the body to fire, causes various physical, chemical and mechanical alterations including colour change, propagation of fractures, shrinkage, warping, deformation, relative cortical preservation, as well as removal of the organic component and modification of the inorganic crystal component. Thorough macroscopic examination of the aforementioned features can provide valuable information regarding fire’s intensity and temperature, the duration of burning events, the amount of raw material which was necessary for the manipulation of fire, the position and proximity of the body to fire, as well as the stage of decomposition of the burned remains (dry, fleshed, or semi-fleshed) at the time of burning. To that, a number of extrinsic and intrinsic factors indicate the process’ complexity and the parameters which need to be taken into account in modern simulations of firing conditions of the past. This paper will present two different experiments which included the combustion of two pig carcasses in different stages of decomposition and the recording of all macroscopic heat-induced changes. Speaking about cremation, we think primarily of the dead body forgetting at the same time the artefacts also placed on the funeral pyre. However, pyre goods are an essential part of the cremation rite. They complement and also define the corpse as they are primal communicational mediums toward the deceased and also the living. For the reconstruction of these functions, however, it is crucial to identify these pyre goods. Ceramic vessels do not burn away, they variously transform only in their colour and condition allowing the recognition of their former presence on the funeral pyre. The aim of my experimental project in 2016-2018 was to observe and further explore these various transformations, then to compare the results to the archaeological observations made on the potteries of a Late Bronze Age cremation cemetery (Jobbágyi, Hungary). Therefore 21 and 25 replicas were placed on the pyres in various position, condition, and content. After measuring and recording the entire cremation process, the pyre places were excavated by archaeological methods. The results of the experiments outline a much more diverse picture of the processes of funerary rituals which the research has always considered to be extremely short on data due to the fact of cremation. Arco via Serafini is an open-air site (80 m a.s.l.) near the town of Arco (Trentino, Northern Italy), originally located a few hundred metres from the northern shores of Lake Garda. The archaeological sequence documents two phases of human occupation dated to the Late Epigravettian, followed by an Early Mesolithic settlement. A series of 15 AMS radiocarbon dates allows the attribution of the Epigravettian phases to the Younger Dryas. The site presents a unique picture of behavioural continuity during the Epigravettian. Fourteen structured areas have been identified: eleven can be attributed to the oldest Epigravettian phase and three to latest. Each area was organised around a combustion feature (“hearth”) structured with fine gravels and sands covering the cooking surface. Through experimental observations and with the support of ethnographic comparisons, we provide data regarding the functional properties of these features paying particular attention to the role of fine gravels and sands. The aim is to provide new insights into the late Epigravettian cooking behaviour and shed some light on the complexity of prehistoric fire technology. A comparison with the combustion features identified at two other sites of the Prealps – Riparo Soman (Early Mesolithic) and Riparo Tagliente (Late Epigravettian) – is also addressed. Objects referred to as bâtons percés represent unique finds in the European Mesolithic. Hypotheses regarding the function of these often richly decorated artefacts have been based so far on theories referring to the earlier products of this type, associated with the Magdalenian culture. They were interpreted, among others as arrows and blades straighteners, picks for forging ice holes, rope tensioners and handles of the throwing weapons. This presentation refers to the results of studies on the function of the Mesolithic bâtons percés, conducted basing on a data obtained by traceological and physico-chemical analysis of the selected artefacts of this type from Poland. They have become a basis for planning and conducting series of experiments, during which, various hypotheses formulated regarding to the function of these tools were tested. It included both, experiments with the use of their blades and holes, as well as the ones that verified the possibility of the post-depositional origin of destructions observed on their blades. The results of the conducted experiments, in conjunction with the results of the microscopic and chemical studies of the artefacts, have allowed to interpret the possible function of this type of products. It was suggested (generally) their possible contact/connection with processing of the siliceous plants. The work was funded by the scientific projects from the National Science Center (NCN) in Cracow (Poland) no. 2016/23/B/HS3/00689. Previous understandings of northern British prehistoric battle-axes have often surmised that these objects were non-functional symbols of power, too fragile to be functional, or purely symbolic or prestigious objects, perhaps of a warrior elite. Older assumptions have also argued for their use as weapons. Such interpretations were based on stereotypical assumptions using modern preconceptions. Through the application of wear analysis and experimental archaeology, the uses of battle-axes have been critically assessed. This has allowed for a reliable assessment of the use of these implements based on fact rather than assumption. The paper presents the results of experiments carried out to test the use of battle-axes and a comparison with the wear traces analysed on a sample of battle-axes from the northern British Isles, c. 2200 - 1500 BC. The importance of the research is twofold: firstly, this is the first time that use-wear analysis and experimental archaeology is applied to a large sample of British Early Bronze Age battle-axes, providing an opportunity to reassess the role and significance of these objects as versatile and hybrid tools; secondly, this is a valuable methodological addition to traceological research on groundstone, which has thus far received less attention than knapped and flaked industries. Although many interpretations exist regarding the function of a spool (or bobbin, it. rocchetto), they most frequently place this usually small and cylindrical object among textile tools. Bobbins introduced in Italy in the Final Bronze Age could have functioned as lighter loom-weights in weaving or weights for tablet woven borders. In Sicilian contexts spool-like objects are present at least since the Eneolithic and continue to be in use throughout the Early Bronze Age. They differ not only in form, size, and primary material, but also considerably in weight. This poster presents the results of a series of weaving experiments conducted in order to verify whether the prehistoric Sicilian spools could have been successfully used in textile manufacture. Three sets of ceramic copies of chosen artefacts (reel shaped, cylindrical with concave body and flat ends, cylindrical with concave body, convex ends, and a diagonal central perforation) ranging between c. 60 and c. 200 grams were prepared for this purpose. The reconstructed tools were used as loom-weights on a warp-weighted loom to weave linen and woollen textiles. The functionality of different types of spools on this kind of loom was then compared on the basis of the quality of obtained textile samples. Differentiating the agent responsible for the accumulation of bone assemblages has been a topic widely discussed in taphonomy. Bone breakage for marrow exploitation is one of the key elements in the nutrition of carnivores and hominins. Moreover, since the Lower Palaeolithic, in some archaeological sites bone has been used as raw material to obtain artefacts. The aim of this work is to evaluate which is the best bone breakage technique to obtain suitable fragments for the production of bone artefacts. We specially focus on the type of percussion and hammerstone, and distinguish the technological bone breakage from the one exclusively related to nutritional purposes. To achieve this goal, experimental bone breakage of bovid long bones is performed in order to get the marrow and to obtain blanks. We contribute preliminary results achieved with direct percussion technique involving both quartzite unknapped cobbles and choppers. Results of the taphonomical analysis of the fragments obtained in the experiment as well as a technological description of the bone tools are presented. In addition, geometric morphometric analysis is included in the technological study. These data create a reference collection in order to investigate Middle Pleistocene knapped bone tools. Investigations in several archaeological settlement contexts shed light on features, generally defined as installations for cooking or food preparing. Usually characterized by burnt or fired area, these domestic structures are very difficult to interpret, to document and even to dig because of lack of information and details related to the construction or to the use. The Laboratory of Experimental Archaeology of the University of Bologna started a program of reconstruction and use of domestic installations with the purpose of sophisticated level of analysis and to solve questions emerged from field research. The first step was to define a protocol according the collection of comparable records, the evaluation of several data mining from archaeometry to ethnography, followed by the construction of some of the structures identified: a bread oven, according the finds of Nola; a cooking plate in clay, according several contexts from Solarolo excavation to Mursia settlement. The use of these structures with several activities in four years allowed to record many details useful for a discussion about the archaeological evidence, as well as the documentation of several phases of abandonment is directly related to the comparison with the features uncovered in the archaeological sites. Bronze Age in Northern Italy was characterized by a demographic increase and the establishment of long-term settlements. Both are presumably linked to a.o. a stable food supply and a well organised production of cereals. According several scholars, this reconstruction goes against the evaluation of productivity based on historical data and open many questions arisen from the archaeological evidence. In order to analyse better these questions the laboratory of Experimental Archaeology at the University of Bologna began a long term project of experimental cereal cultivations in order to lay the basis for a better comprehension of human activities and environment in Bronze Age. The project based on the selection of historical seeds of several kinds of cereals (barley, emmer, einkorn and other wheat taxa - triticum aestivum, triticum spelta) proceeded with their cultivation for four years in small size surfaces. The calculation from seeds for sowing from what obtained with the crop allowed to estimate the rate of production, as well as some observation during the process suggested to define the evidence of natural and anthropic factors. Among them, the importance of irrigation or drainage, ploughing methods, types of sowing, tools for harvesting and threshing, useful for understand the crop management. This contribution aims to present the experimental reconstruction of a prehistoric underground oven replicated according to the archaeological structures found in the Early Neolithic site of Portonovo-Fosso Fontanaccia (Ancona-Italy). The archaeological investigations, conducted by the Sapienza University of Rome, identified a number of circular ovens with a single central opening, concentrated on a slope. Although preliminary observations lead to hypothesise that these structures were built by digging the natural sediment, some questions regarding the actual procedure and the amount of time needed, remained unanswered, requiring a dedicated experimental reproduction. An underground oven, measuring 190x180 cm in diameter at the base, 50cm in height, was built in 15 hours digging a sediment compatible with the archaeological context. A kit of wood, flint and hard animal materials’ tools were selected according to the raw materials and plant species available on the site and were used for testing their efficacy. A detailed description of working stages, techniques and tools involved, is discussed in this contribution shedding a new light on building and use of Neolithic structures connected with pyrotechnology. Fishes were an important part of a diet of the early Holocene and even earlier communities. Tools related to the processing of this raw material were discovered, among others, at the Neanderthal levels of site Payre in France and at the Mesolithic site in Starr Carr. Fishes were probably caught not only for consumption but also for other materials like bones or hides. The hides obtained from them could have been used for many activities, for example, clothing sewing, container production or as decorative elements. This presentation will introduce the preliminary results of a first stage of an experimental program which has been started recently at the Institute of Archeology Nicolaus Copernicus University in Toruń, aiming to extension of our knowledge about the characteristic of the usage traces typical for tools used to treat this raw material and possible techniques of its processing. The aim of the first stage of experiments was a try to tan the hides of several species of fishes to the condition allowing use for the purposes mentioned above. The fishes were treated with flint blades and flakes. The works were divided into following stages: scaling, cutting the skin and meat, skinning and fleshing by scraping. This paper aims to present a techno-functional study of the "lignite" ornament findings found during the Fedele excavations (1977-1980) in the Boira Fusca Cave (Cuorgnè, Salto-Turin). The site consists of a chrono-cultural sequence that starts from the late Paleolithic and reaches the Modern era. Particularly during the first age of the Metals (Age of Copper-Early Bronze Age) the cave has seen a sepulchral use according to a widely diffused rite in the alpine area at the time. The technological study of manufacturing methods, based on a wide experimental base and conducted with the aid of digital microscopy, focused on drilling and shaping techniques. This method is a very valid approach to identify cultural peculiarities comparable with other contemporary contexts. For each type of element, the main technological phases have been reconstructed and any use indicators will be highlighted. In particular, the presence of beads of small dimensions is the most significant aspect of the studied corpus. In fact, although between the Neolithic and the Early Bronze the beads with microperforations are quite numerous (normally on microlithic supports less than 3 mm in diameter), there are no clear hypotheses on the techniques and instruments used during the drilling activity. Plaster and masonry built with earthen mortar are widespread in vast areas of Italy at least until the middle of the Nineteenth century. In Cremona a research has allowed to characterize the local earthen mortar: the archival and bibliographic examination has followed by a chemical and petrographic analysis and a relief of the different construction techniques: the mixture of earth, sand and quicklime is documented by the archaeological excavations of Roman imperial buildings and its use was attested in buildings of great importance between the medieval age and the 19th century. The collected (theoretical) data were used to define a trial, with the students of the course of “Experimental Archeaology” at the Politecnico di Milano: plaster and some small masonry built with earthen mortar were realized. The trial allowed to better define the method to produce earthen mortar, the quantities and the sequences of row matherials mix, and the consequences on the workability and application of mortar on existing buildings. The continuous comparison between practical experiences and previous research results has allowed us to respond to doubts and, at the same time, arise new questions, yet to be solved. The paper will describe the adpted methods and tools and expose the results of the experimentation, identifying the unresolved issues. We propose the experimentation carried out for the reproduction of the Etruscan mirror known as "della Galassina", dated between the 6th century BC. and the 5th century BC, from the burial no. 1 - female - of the Castelvetro necropolis (Modena - Italy) and currently conserved at the Estensi Galleries in Modena. It is a figured bronze mirror, decorated on both sides: on the reflecting part there are various concentric decorations and a palmette; on the other side some scenes that refer to the celebration for the wedding union. From the technical analysis of some data it was possible to identify some technical details, found on the original, which allowed us to hypothesize for the realization of the complex figurative decoration a direct execution on the wax model and not at "cold" after the merger. From the observation of the evidence on the original it was possible for us to reconstruct the entire chaîne opératoire. All the phases of the experimentation were performed respecting techniques, materials and tools used in the Etruscan context. The results were extremely satisfying and confirmed our hypotheses formulated on the decoration performed directly on the wax model and on the various stages of processing. During the 11-13th centuries a significant weapons industry developed in the eastern Baltic. Local societies went through the formation of early statehood, where a demonstration of power, status and wealth was important in the struggle to power. This process was interrupted by the Baltic crusades during the 13th century when after almost a century-long war, part of the local leaders became vassals of Livonian Order. During the 11-13th centuries a sword type known in the literature as a “Couronian type” was the most popular in this region. These swords have characteristic five parted pommels and cross guards made out of bronze and often have local Baltic ornament; however, almost all investigated blades carry Christian inscriptions. These swords are also usually accompanied by a local type of bronze scabbard chapes. However, the number of the finds reaches several hundred, there is almost no evidence about moulds used for the production of bronze sword parts and only some of the artefacts surface bear visible traits of the actual production technologies. During 2017-2019 several attempts were made to reconstruct the production sequence, based on the marks on the surface of actual finds comparing with the materials available locally for moulds. Participation archaeology is the basic inclusion process of a human community to identify its cultural values. Experimental archaeology can be considered as the starting point of the recovery process of the immaterial cultural heritage. The knowledge of these elements generates an appropriation, a sense of belonging and a participation in the culture. 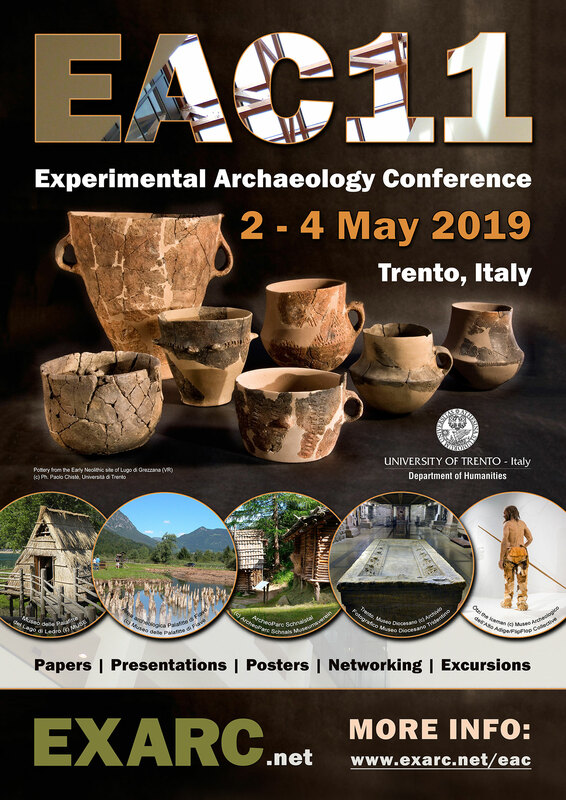 Archeofest of Paleoes - EXTAD, is the Italian Experimental Archaeology Festival, born to promote the community’s cultural values, through the research, knowledge of ancient technologies, involving different publics in the cultural heritage reappropriation process. The project is based on Paleoes researcher’s experimental activities: protohistoric textile weaving tools, sheep shearing using obsidian blades, lithic tools functional studies, toreuta toolkit reconstructing. Started in 2014 the Festival took place in archaeological parks up to the latest collaborations with the Museum of Civilization and the National Etruscan Museum of Villa Giulia in Rome. We present the Archeofest experience, its scientific, didactic and training value with a view to the participation and to the inclusiveness. Coming to experimental archaeology as historians, beyond the more typical backgrounds of archaeology and anthropology, we are intrigued by the potential of experimental archaeology to shift our narratives about the past. We (along with our students) have quickly become evangelists for the experimental approach, but we are among the few historians drawing on these insights and results. Therefore, our paper examines ways in which experimental archaeologists might better reach and integrate their findings into the discourse of history. Collaboration with historians and history departments at schools and universities, we argue, can help experimental archaeology by demonstrating the legitimacy of the field, broadening its appeal, and justifying its practice. Epistemological debates within experimental archaeology dovetail neatly with similar debates among historians about objectivity and about the nature of historical knowledge. Finding ways to talk more directly to one another, we propose, will enrich both disciplines. Poster 13: From the Experiment to the school Dissemination. How to spread a local prehistoric Culture among Students in an interactive Way? In the past decades, the scientific dissemination of history to the elementary school students has been linked to the narration of important facts and figures. Recently, pedagogy has shown great attention in social phenomena dissemination and everyday life. Laboratory activities are particularly suited to focusing children's attention on concrete facts of past life. On this occasion we started from the experiment in 2014 reproducing and analysing the early Sicilian Bronze Age painted surface decoration of the castelluccian pottery. During the activity with primary school children of Agrigento (an area where that prehistoric culture and pottery are widespread) we reproduced prehistoric pottery according the technique which we previously analysed. Interactivity and tactile experience have fundamental importance to attract the attention of primary school students to the prehistory of their native territory. The present work's aim is to disseminate a past local culture through an interactive activity starting from the scientific method of the previous experimentation. The laboratory allows children to experiment recreating objects with their hands according to the ancient techniques which are clearly visible and easy to memorise. The Museu d'Arqueologia de Catalunya (MAC) was created under the Museums of Catalonia Act in 1990 by the Department of Culture of the Government of Catalonia. Its foundation dates back to 1932. The museum develops various actions related to experimental archaeology both in the field of education and in research. It develops an extensive activity in the framework of Neolithic research projects on techno-technical issues of various artisanal productions such as in lithics, woodworking and architecture. MAC also carries out university training in Archaeology of the UAB (Barcelona) and a Master's Degree where experimental practice is the basis of the training. In this sense, the museum directs research work (PHD and master's degree projects) where experimentation plays a fundamental role. In regards to outreach, the museum presents demonstrative and participatory activities in its educational offer where experience plays an essential role. Finally, the MAC incorporates graphic and audio-visual material in its museographic productions where the experimental reproduction of techno-functional processes is essential for the outreach of the exhibition message. At this time, the MAC is developing a project where experimentation will be consolidated as the axis of the outreach, the academic training action and its research. In the late 5th century, famous Ostrogoth Theoderic the Great received a truly regal gift from the king of the Warini: highly elaborated swords, richly decorated and able to cut through armour. Their fullers were so well made it was as if worms (or dragons) were crawling upon the surface. But the most outstanding feature was indeed the surface of the blades: so expertly polished as if to create “a mirror for men”. - Are the visual sources significant enough to reconstruct the polishing bench and its tools? If not, what needs to be changed? - Do the illustrated working procedures work at all or are they just conceptual? - Which medieval methods and abrasives are best suited for the task? In collaboration with Dr. Stefan Mäder and the Deutsches Klingenmuseum Solingen and a lot of hard polishing work I was able to resolve this myth of the mirroring swords as a truth. Cyprus was known since antiquity for its copper ore’s wealth and Cypriot copper was traded through the Mediterranean until the Roman Empire. The most abundant copper ore present on the island although is chalcopyrite, a copper sulphide which, differently to other copper ores easier to smelt such as copper carbonates, requires a multistage process to be smelted. The technology necessary to smelt copper sulphide has been recorded at Late Bronze Age sites in Cyprus, where shaft furnaces and bellows were used in the metallurgical process. The analysis of the archaeological material from the 2nd millennium BC proto-industrial settlement of Pyrgos-Mavroraki (excavated by the Institute for Technologies applied to the Cultural Heritage of the Italian National Research Council from 1996 to 2012), allowed to deepen our knowledge about the Early/Middle Bronze Age evidence of metal processing in Cyprus and to design specific research protocols to carry out copper sulphide smelting experiments. The experiments carried out at Newcastle University investigated the possibility to smelt Chalcopyrite in simple bowl-shaped furnaces with the aid of just blowpipes. This topic takes a look at the internal rib phenomenon of the Irish Late Bronze Age socketed axe. Socketed axes, particularly in Ireland, retain the presence of one or more 'ribs' located inside the socket of the axe. These ribs, often referred to as 'haft ribs' have been interpreted as functional to the haft, acting to split the haft, wedging it tightly into the socket. However, many of these ribs appear to be too short to function in this way, leaving their current raison d'être unsatisfactory. It is apparent that internal ribs became a recurring part of the moulding sequence, resembling the negative impression of a step in the casting process that is today little understood. My 2017/2018 master’s thesis reconnects with this process, by experimenting with the placement of internal ribs in the moulding sequence, testing two previously presented possibilities for their appearance, comparing macro-morphological trends with the archaeological data. Poster 18: Bronze Age Kilns in Northern Italy: where they were located and how they were made? Despite the huge amount of pottery found systematically in all Bronze Age, settlements, there is only limited evidence of ancient kilns so far. We suspect that this lack of information could stem from a misunderstanding in the archaeological research. This led to an experimental project carried out at the laboratory of Experimental Archaeology of Bologna University. Persuaded that the small amount of data available does not represent the unique marker of ancient production of pottery and that the experimentation could help to find more evidence, the activities included the reconstruction of different models of ancient kilns, from the open structure to the more structured kilns with horizontal ventilation. The construction process, steps of firing, the application of several choices linked to fuel, duration etc., the expected result of firing (colour and temper reducing or adding oxygen) were observed or activated recording every information useful to reconstruct the chaîne opératoire. At the end of the activities, the phase of abandonment is also considered of extreme importance, especially for the interaction with the archaeological context: some observations lead to explain the lack of kiln remains inside the ancient settlements and suggest how to proceed in documenting archaeological excavations. The poster focuses on one of the most “international” pottery shapes used by the communities of Northern Mesopotamia during the 7th and the first half of the 6th millennium BC: the so called husking tray. These are large trays made of a coarsely strew-tempered clay with a very wide oval base and low sides. Their most interesting feature is that they show an interior surface characterized by incisions and impressions. Several scholars have suggested various hypotheses about how the husking trays could have been used, but these have remained merely theories until now. Husking trays replicas were carried out and submitted for experimental analysis. As a final result it seems that the husking trays are functional for baking bread. In order to improve our understanding of their function, technological and functional trace analysis have been conducted on the fragments of husking trays, and the present poster will give an insight on the first results obtained. In 2016 and 2017 several experimental replica pit fires were held to better understand archaeological evidence found at the early Neolithic site of Lugo di Grezzana (VR) which relates to Fiorano culture (5500 – 4900 cal BC). Through experimentation we tried to rebuild the steps of those processes connected with fire use as shown by the investigated structures: charcoal and ash remains, wall rubefaction, oxidized sediments, artefacts and ecofacts modified by fire such as burnt clay, and entire burnt beams at the bottom. Pits, morphometrically similar (circular or squared) with dimensions that vary from a minimum diameter of m 0,85 to a maximum one of m 2,10, may have had several functions: all experimentations evaluated the hypothesis about their use related with pottery firing and confirmed, that pits with bigger dimension (ES 473/03=920) could have been used for this purpose. They also allowed the observation of several variables involved and to understand how each of them can influence results such as fire traces or thermal profiles of the structure. SEM-EDXS and FT-IR analyses on both archaeological and experimental samples of fired sediments offered an interesting comparison that allowed to make several considerations that will be discussed in this paper. In the last 30 years experimental archaeology has provided a huge contribution to the interpretation of lithic artifacts tipologically defined as "scaled pieces". Once considered retouched tools, scaled pieces are currently identified as products-residues of bipolar knapping or result of the use of lithic pieces as wedges/gouges for processing mediumhard organic materials. At Grotta La Fabbrica (Grosseto, Italy), unlike Mousterian, in the Uluzzian and Aurignacian lithic industries scaled pieces are very important. Using the same local raw materials utilized by human groups that populated the cave, we tried to experiment the possible ways to obtain scaled pieces. Whilst we refuse an univocal interpretation of this kind of artifacts, all the elements seem to show that scaled pieces of Grotta La Fabbrica industries are probably products and residues of bipolar knapping. The use of this technique, probably related to the type of raw material supply and the nature of human occupations of the cave, seems to further emphasize the presence of an important discontinuity between the Mousterian and the Upper Paleolithic phases. There have been few attempts to conduct sequential and highly-controlled experiments in the laboratory, to isolate how wear formation processes propagate on metal artefacts during simulated use. It was the aim of this research, therefore, to establish a multi-method approach to model the progression of surface wear and the appearance of major deformation phenomena on replica palstave axes, for the purpose of clarifying the use-intensity of their prehistoric counterparts. This involved using a drop tower (Instron CEAST 9350) to conduct experiments on replicas with several alloy compositions and post-production processing, to study the sequential development, form, and properties of surface wear and major deformation phenomena, in isolation from interfering variables. The analysis variably included photography, macroscopy, low-power microscopy, high-power microscopy (SEM), microhardness indentation and metallographic techniques. This presentation will critically examine the results produced by the use of the mechanised and sequential approach detailed above. Thus, it will explore the possibility of attaining previously untapped insight by controlled and repeatable testing, as well as the complications of reconciling the results with actualistic testing, and the difficulties associated with transferring the potential of the experimental data onto archaeological specimens, due to issues like sharpening, corrosion, and past conservation practices. The oldest bifacially shaped “handaxes”, so far known, belong to the “Kokiselei 4” site (West Turkana, Kenya) dated to 1,76 Ma (Tixier, 2018) and have been manufactured by direct lithic percussion on magmatic effusive stone materials. Considering that the evolution of “fully operational intelligence” (Wynn, 1979) has been associated with the so called “Modo 2” chaîne opératoire, it seems interesting verifying the potential adaptive meaning of selecting scarcely isotropic kinds of stones. This techno-behavioral approach, somehow similar to the so called “lithic translation strategy” (Chelidonio, 1997), an hypothesis that could be applied to the Fontana Ranuccio (400 ka BP, Latium/central Italy) handaxes: in this very peculiar acheulean assemblage, bifacially shaped tools were manufactured mainly of local “basalt” but also roughly manufactured by flaking off thick elephant bones (Pereira et alii, 2018). The above mention hypothesis is preliminarily tested by experimenting “Mode 2” techno-evolutionary step on some “basalt” samples at my disposal, in order of verifying symmetrical flaking results applied to non-vitreous or non-cherty kind of stones. Obviously, future tests on “basalt” kind available in the Fontana Ranuccio area must be promoted to deepen adequately the techno-behavioral meanings of this peculiar lithic assemblage. In the Iron Age open-air museum Mitterkirchen in Upper Austria an architectural model of the Hallstatt Period was built up in 2016 and in 2017. During the erection process techniques and methods of Experimental Archaeology were used. The new house model should show the high standards of Iron Age wood technology to the public. In the future it will be used for visitor activities as well as for running big events on site. The measurements of the ground plan are about 21 to 9 meters and the gable reaches up to 8 meter. We are quite sure that the original house was planned and built up on the basis of a determined module measure of 18,48 cm. The working Team of VIAS consisted of 6 to 8 persons. Up to a high degree the activities were carried out with remakes of Iron Age tools. Thereby a lot of time was spent on the preparation of the squared timber. During the erection we tried to figure out all single working steps using original techniques. The project gave the chance to work out a better understanding for house building processes in the first millennium BC. Boats represent an important tool for survival and exploring from as early as prehistoric times. Artefacts like the Hotiza logboat, one of the oldest and, the Vrhnika logboat which is one of the largest, both found in Slovenia served as inspiration for the birth of Projekt Navis. In 2016, the institutes Skupina STIK through Arheofakt, alongside with the Institute for Underwater Archaeology and Škrateljc, initiated the project. We used logboats as models for the building and for the promotion of cultural and archaeological heritage. Each year, the team attempts to construct a vessel from a certain historical period using replicated tools and techniques available at that time. One of the most important aspects of the project is first-hand building experience and public involvement. This project offers an efficient way of introducing aspects of historical living to the public in the urban environment. Visitors are encouraged to get involved in the building process or they can attend various workshops and events that are held during the time of construction. Finally, when the vessels are ready we send them for their maiden voyage on the river and, the past becomes part of contemporary life. Palaeolithic and Mesolithic lithic assemblages often contain a considerable amount of light to heavily burnt flint artefacts, e.g. as a result of accidental or intentional burning in fire hearths. Often those artefacts experienced sudden rapid heating and extremely high temperatures, unlike what happens with intentional heat treatment. To investigate the influence of such conditions on flint, controlled archaeological experiments were carried out both in laboratory and open air setting. In the first, flint artefacts were heated in a muffle furnace under controlled conditions. In a more realistic environment, i.e. open air setting, the artefacts were positioned at different distances from the centre of the fires. Temperature was monitored using a heat camera and infrared thermometer. This way, the behaviour of flint in the two different settings was examined. The developed methodology allows to study the different transformations in flint material during heating, both at a geochemical and a structural level (e.g. cracks, potlids, colour change). Eventually, the extent to which heating processes affect the preservation of prehistoric use-wear traces will be investigated. This way, a critical assessment can be made of the potential information loss caused by disregarding heated flint artefacts, as is often the case in microwear studies. A reasonably large amount of Palaeolithic and Mesolithic artefacts and ecofacts are found burnt in hearths and flint tools are no exception. These tools are mostly discarded from microwear analysis, which potentially causes a significant loss of knowledge about prehistoric life. While heat treatment on flint to increase knappability is currently a quite popular research topic, the effect of burning on the preservation of microwear traces is insufficiently investigated. To study this effect, a protocol for burning used flint tools in an open fire setting was developed in order to achieve slightly, moderately and heavily burnt pieces. Wear traces were analysed before and after burning. The protocol is based on previous work on prehistoric fuels, heat treatment, fire places and residue preservation. Controlled archaeological experiments were carried out using flint tools knapped from four different raw materials used on archaeological sites in NW Belgium during the Mesolithic. Following the microwear analysis of two archaeological sites, Doel- Deurganckdok and Kerkhove-Stuw, the most important activities were replicated, i.e. wood, plant, hide working and butchering. Activities were carried out for two different time durations to be able to examine weakly and well-developed wear traces. In this presentation, we will present the methodology of burning experiments to investigate their impact on the preservation of wear traces from an archaeological and geological point of view. Detailed identification and processing of fractures that are made by impact is important for better understanding of stone tools usage and for avoiding their misinterpretation, but without ignoring other use-wear traces. The focus of this research is not establishing the diagnostic impact fractures (DIF-s), but an attempt of establishing the correlation between impact fracture types and their causers using experimental approach. Using Paleolithic way of projecting mode, two types of hunting technologies (thrusting and throwing spears), two types of hafting (vertical and diagonal), and beeswax as an binding material, spears were propelled into a dead animal target (Sus scrofa). Stepterminating fracture represents a problem because it was identified in both delivery and hafting methods, and all possible end point outcomes. Burin-like fracture is mostly present on vertically hafted spears. Hafting Mousterian points diagonally is not functional for thrusting spear-hunting technology. More research with higher experimental samples is needed for more reliable conclusions of factors influencing propagation of impact fractures. 4Centro Nacional de Investigación sobre la Evolución Humana (CENIEH) (ES). The aim of this communication is to introduce the scientific works performed in the Sierra de Araico Neolithic Mining Complex, mainly located in the Treviño enclave of Spain, in the Basque-Cantabrian Basin, between Burgos and Álava provinces. This site is unique since it has been used from Prehistory to nowadays to intensively dig out high-quality flint cores. This type of Flint, called Treviño, has had a wide circulation in archaeological sites of the Cantabrian Mountains and Western Pyrenees. The interdisciplinary research applied to this site involves LiDAR prospecting and geological, procurement, typological, technological and functional research related to flint blanks and different mining tools manufactured on the local flint. The research also includes the study of other raw materials, as hammer stone of ophite and antler picks. Different experimentations, related to the comprehension of mining processes, has been carried out in order to clarify the archaeological findings of the site. Particularly, we present the results of (1) an experiment on flint changes produced by contact with fire and (2) an experimentation on the replication, utility and uselife of hammer stone to dig out the flint cores. The idea for this research yield from the use-wear observations of knapped artefacts found in the houses of Mesolithic and Neolithic sites in the Iron Gates region (Serbia). Part of the sampled tools was damaged by fire manifested by different signs of heat treatment like cracks, pits, pores, glossy appearance. Many of the analyzed artefacts were found in the ash places, or in the vicinity of the hearth which explains its condition. Different stages of fire damage were observed and for this reason, conducting the experimental study of qualifying and detecting the heat treatment was necessary. Firstly because of the detection of various stages of thermal alteration and secondly of its impact on use-wear traces, having in mind that some of the traces happened after the fire damage. The study is divided into three stages: observation of the experimental tools before fire treatment, and during the heat treatment, after every session of gradual temperature change controlled in the experimental furnace, and at the end, comparing the results with results of use-wear analysis and data associated with thermal alteration on the archaeological sample. In this way two important parameters are observed; after what time is what kind of alteration created and at which temperature they develop. The Italian region called Lunigiana, today between Liguria and Tuscany, is rich in sandstone statues worked since the third millennium BC until the beginning of the historical period, around the 6th century B.C. Eighty statues have been collected and show stylized male and female characters with some characteristic elements such as weapons or necklaces. In this long period, more than 700 statues of this type are present in Europe. All the “Statue Stele of Lunigiana” are made of sandstone, a sedimentary rock of the upper Oligocene epoch. In the archaeological site of Pontevecchio (Northern Tuscany), in 1905, nine anthropomorphic statues were found lined up, both male and female. The place is a pleasant clearing at the intersection of small streams around a wooded area. In the Archaeological Museum of La Spezia, in 2018 on the occasion of the thirteenth Paleofestival, which I curate since 2005, some operators were asked to represent some daily activities of prehistory to make videos for video guides for the La Spezia museum. I had to take care of the protohistoric ceramics and the “Statue Stele of Lunigiana”, which are mostly collected in this museum and in the Museum at Pontremoli (Northern Tuscany). For the film, I had to perform different activities on different small areas of the stone slab taken just in Pontevecchio site to make the most of the work's philology. I had to explain the various phases during the short recording of the film that would then be mounted in the studio. To realize the new statue I was inspired by the model Pontevecchio 5 and I used only tools made with local raw materials such as red jasper instead of the flint that is not in the area. The work seemed initially boring and trivial but instead highlighted some interesting technical aspects in the various activities of transport, roughing, hammering, chiselling, drawing, engraving and polishing. Poster 32: The Arrowheads of the Squared-Mouthed-Pottery Culture: Reconstruction and Shooting Experiment to understand the Needs, Advantages and Problematics of flint Projectiles. Basing on archaeological objects from settlement and burial sites of the Squared-Mouthed- Pottery Culture, which in Northern Italy covers the period corresponding to Middle and Late Neolithic (i.e. Fimon-Molino Casarotto, La Vela, Isera-La Torretta), replicas of flint arrowheads will be knapped and shot with the aim of getting a better comprehension and interpretation of the archaeological record itself and of the traces that are left on archaeological findings. Moreover, we would like to investigate the advantages and limitations of the main two types of arrowhead in use within this Culture (with stem and with flat base), to understand the chaînes opératoires and if this duality is linked to technological choices or is rather a cultural adoption as a result of interaction and exchange with neighboring human groups. The poster will present to the academic community and to the public the whole stages of the experimentation, from the drawing of the concept, to the realization and the evaluation of the results.